Title: The Sound of Sonny. Label and Catalogue Number: Riverside RLP 12-241. Personnel: Sonny Rollins (tenor saxophone); Sonny Clark (piano); Paul Chambers (bass); Percy Heath (bass); Roy Haynes (drums). Side 1: The Last Time I Saw Paris; Just in Time; Toot, Toot, Tootsie; What is There to Say; Dearly Beloved. Side 2: Every Time We Say Goodbye; Cutie; It Could Happen to You; Mangoes. Recording Date: 11, 12 and 19 June 1957 at Reeves Sound Studios, New York City, New York, USA. By 1957, Sonny Rollins was established as the pre-eminent tenor saxophonist in modern jazz. Stints with Miles Davis, the Clifford Brown/Max Roach quintet and Thelonious Monk and a stunning series of records under his own name for Prestige Records had provided ample justification for the soubriquet Saxophone Colossus. This solid foundation provided a launchpad for Rollins to become more adventurous on two fronts. Firstly, he began to experiment with different group formats: most notably, piano-less trios. Secondly, he sought to avoid long term commercial ties to a single record label. After leaving Prestige in 1956, Rollins cut LPs for three different labels (Blue Note, Contemporary and Riverside) in 12 months. This record, The Sound of Sonny, was taped right in the middle of this hectic productive period. Rollins serves up a typically eclectic and engaging mixture for his first Riverside record. He gets close support from compadre Roy Haynes on drums (these two great jazz survivors remain life-long friends to this day), the alternating bass talents of Paul Chambers and Percy Heath plus fresh new-on-the-scene pianist Sonny Clark. We are kept on our toes right from the outset with a piano-less rendition of The Last Time I Saw Paris. The focus here is, naturally, on Rollins’ full-toned vigorous and confident playing but there’s plenty to admire in Haynes’ typically precise stick work. The rest of Side 1 takes us on an enjoyable ride through a state-of-the-art tenor saxophone quartet repertoire with a twist. Never one for the obvious choice when picking show tunes, Rollins selects either tunes with a quirk or takes tired clichés like Toot, Toot, Tootsie and burnishes them with a new angle. Even if you’ve only got time to listen to a single side, this first half provides satisfying nourishment and it’s worth keeping an ear out for a series of brief yet sparkling contributions from Clark. The first two tracks on Side 2 extend the mood. Both Every Time We Say Goodbye and Rollins’ sole composition on the record, Cutie, continue that insistent, relaxed swing. These full quartet numbers provide several highlight opportunities for each instrument without lengthy over-indulgence. Then we’re knocked out of our comfort zone with the surprise rendition of It Could Happen to You. 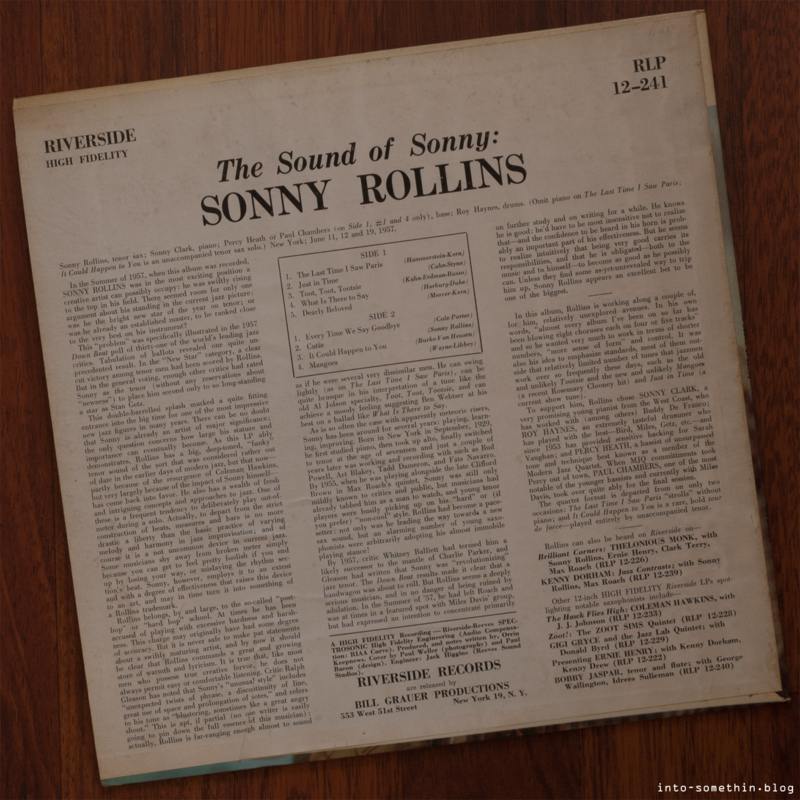 This tune was a popular vehicle for several groups of the era but this time it foreshadows what was to become a Rollins trademark: the unaccompanied performance. There’s no hiding place and Rollins doesn’t seek one. It takes a player of either misguided hubris or genuine mastery to attempt something like this. I think it’s a no-brainer that Rollins easily qualifies as the latter. Matters are brought a close with the band’s take on a popular Rosemary Clooney hit of the time, Mangoes. Haynes gets another chance to showcase his crisp technique as he embellishes the tune with a latin flavour on introduction and continues to conjure a variety effects throughout behind Rollins. If I were to try to characterise The Sound of Sonny, I’d say it was a choice record for Sunday morning listening rather than one for a Saturday night dancing. The groove is relaxed, precise and thoroughly enjoyable without ever lapsing into the mundane – ideal accompaniment to a hip late breakfast of coffee and croissants! As is so often the case with Riverside LPs, the author of the liner notes is company co-owner and producer Orrin Keepnews. In wearing the several hats of liner notes writer, record company owner, producer and jazz enthusiast, Keepnews often set himself the challenge of needing to balance several competing priorities. In this case, the imperative to promote the star artist seems to have won the day with at least three quarters of the copy devoted to the subject of Rollins and his achievements. There are plentiful references to Rollins’ magazine poll winning accolades, his skills as a performer and admiring quotes from respected critics such as Whitney Balliett. All of which are artfully placed without a single reference to any of Rollins LPs for other record labels. I’m a fan of Keepnews’ writing but it does draw a wry smile when he understandably and (not so) subtly focuses on the commercial necessities of Riverside. 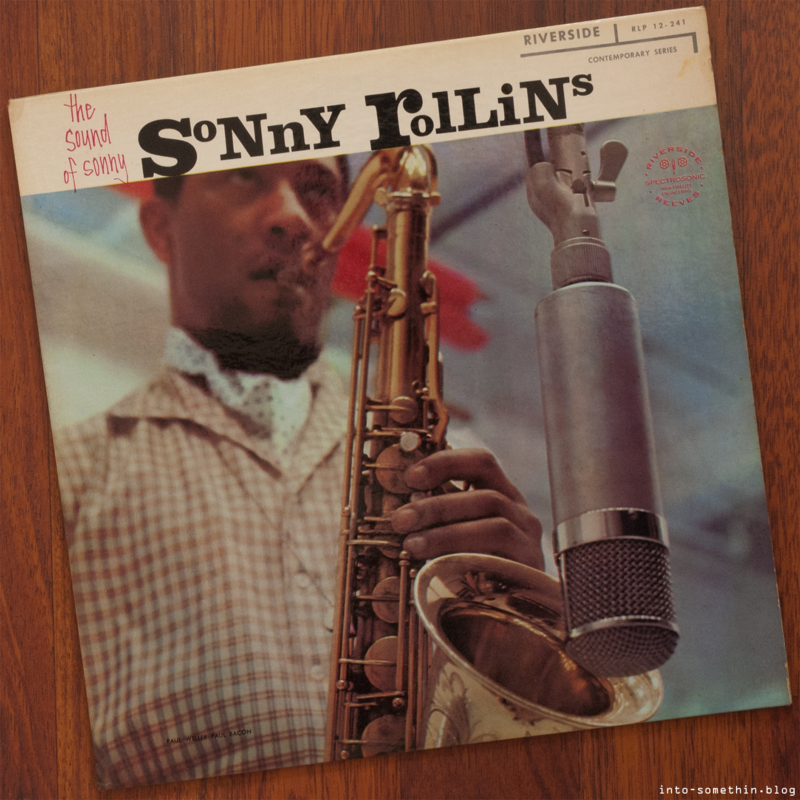 Like all perceptive jazz writers, though, Keepnews does manage to accurately forecast a greast future for Rollins when he writes “Sonny Rollins appears to be an excellent bet to be one of the best”. The Sound of Sonny was first released at a time that pre-dates the famous royal blue and silver Riverside labels. Instead, both sides of this beauty are deep groove and sport the earlier white labels with sky blue and black over-printing. One of the drawback of these early white labels is that they run the risk of showing ageing and you can see evidence of a few blotches in the picture above. However, this is no reflection on the condition of the vinyl itself which is 145g of Near Mint loveliness. Side 1 has a hand etched “RLP-12-141-A” matrix number and the equivalent “RLP 12-241-B” hand etched slightly more boldly. 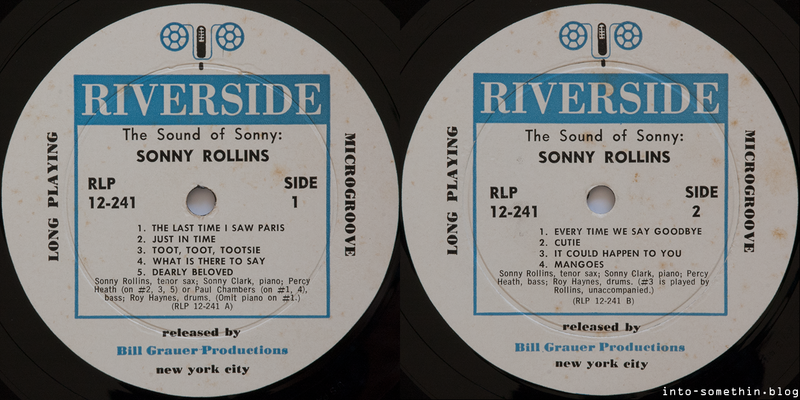 Both sides also bear UK (713418) and US (RE 23946) machine stamped patent numbers that sometimes on appeared on Riverside pressings. These patents were filed in 1949 by Alan Ellsworth of the Research Craft pressing plant in California, USA and pertain to the raised rim and raised central label area that were designed to protect the grooves when records were stacked in a record changer. The cover is a tale of two halves. The front is vibrantly coloured and well laminated with sharp corners. The only signs of wear being a little ageing and staining on the white upper portion. The rear is intact without any tears but shows greater signs of handling over the years. Overall, though, this copy exhibits all the signs consistent with a mono first pressing. A can’t miss line up. I’d love to track this one down. Great post. Thanks Chris, I’m glad you enjoyed it! With each new post I inch closer to how I’d like them to be. The first pressing with white labels is hard to find but it was also issued with the later blue and silver labels and that should be a bit easier to locate (and less harsh on the wallet too! ).